The Archbishop Nathanael Banza was born in Mbuji-Mayi in the Democratic Republic of Congo. An engineer by training, he also trained at the Biblical Institute in Holland for his pastorate. 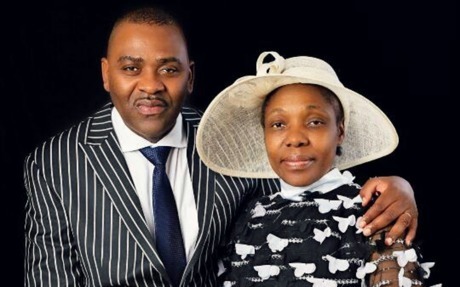 Born in Kinshasa, Pastor Mireille Ngalula Banza received The Lord Jesus Christ at the age of 14. Serving The Lord for more than ten years, she had been very active in intercession and evangelism, preaching in hospitals (CNPP, Kindele, etc. ), the prison of Makala, markets, public transport,and different churches in Kinshasa. Eben Ezer Ministries named Hadassah is a prayer cell , which aims to bring the message of repentance to all five continents and bring the Church, the Body of Christ, to the true worship of our Lord Jesus Christ through the message of repentance and holiness of the body, soul, and spirit without which no man shall see GOD. To this end, the Archbishop couple Banza has also received the Lord's mission to organize conferences, seminars, and pilgrimages: Hadassah Meeting, Hadassah Night, and pilgrimages in Israel for the glory of GOD. Together, the Archbishop Nathanael and Pastor Mireille Ngalula Banza have over 24 years of ministry and over 36 years in The Lord.